Discovered in 1848, Hyperion is a moon of Saturn and the largest nonspherical moon in the solar system. It was also the first nonspherical moon to be discovered. 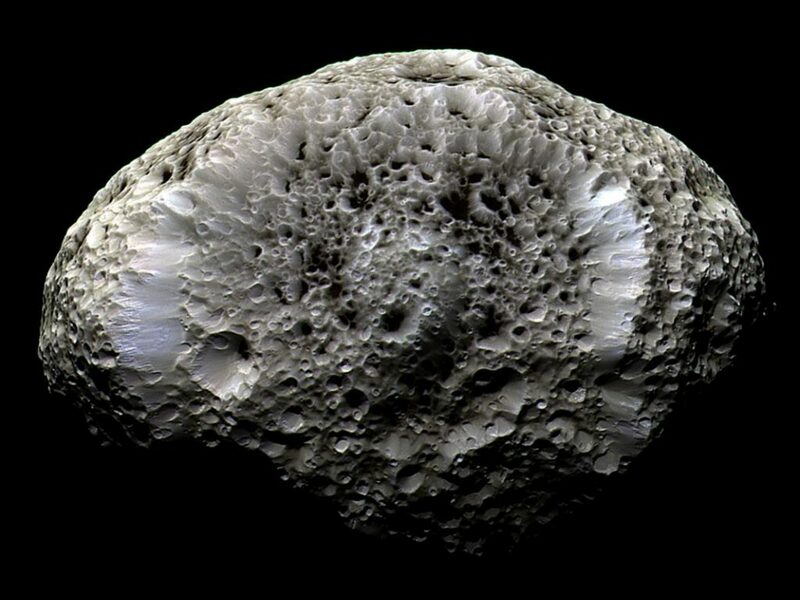 Hyperion has a distinctive appearance unlike any other moon, with its irregular shape and unexplained sponge-like appearance. 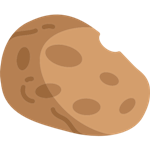 It is also the only regular planetary moon not to be tidally locked to its planet. Fast Summary Facts About Hyperion! Name: From Greek mythology, Hyperion is the mythical brother of Kronus (Kronus in Roman is Saturn). Also originally designated Saturn VII. Hyperion was discovered in 1848 by William Lassell and the father-son team of William and George Bond who’ve been jointly credited with the discovery. Following John Herschel’s suggestion in 1847 that the names of Saturn’s moons be named after the mythical brothers and sisters of Kronus (equivalent in Greek of the Roman god Saturn) the name Hyperion to the moon. Some astronomers also refer to Hyperion as Saturn VII; being the 7th moon major moon from Saturn. Hyperion was also the first nonspherical moon to be discovered. 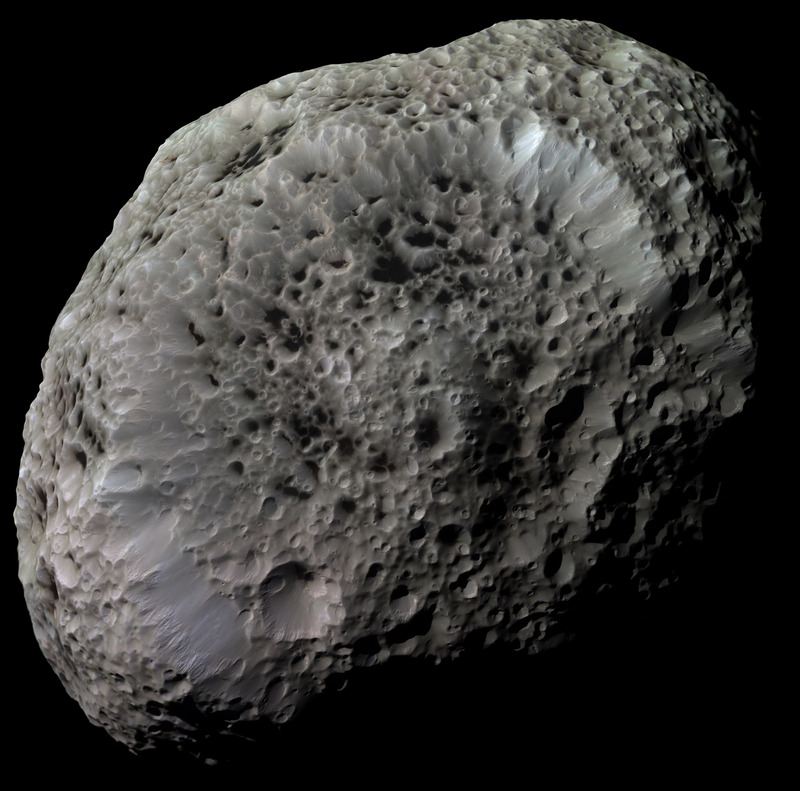 Hyperion is the largest of Saturn’s irregularly shaped moons (and the largest irregular moon in the Solar System) with diameters along the three axis of 410 x 260 x 220 km. 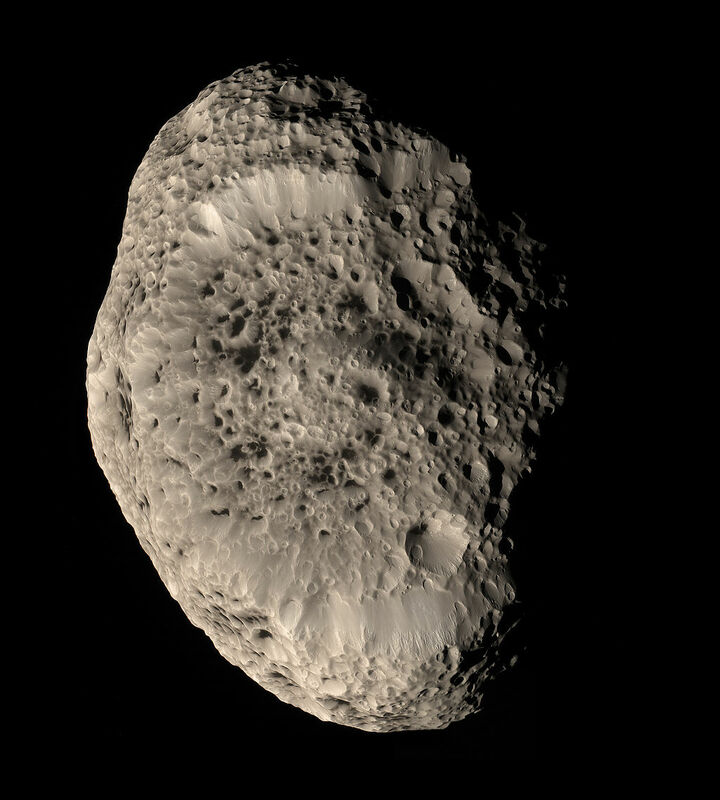 Hyperion’s irregular shape is likely due to a large impact, which blasted off existing material. Hyperion has a density of 0.54 times that of liquid water. This suggests Hyperion is composed mostly of water-ice with either high degree of porosity (gaps within the water-ice) or composed of additional lightweight material like frozen methane or CO2. The moons low reflectivity implies the icy surface is covered in a thin dark material. Hyperion’s orbit and rotation are unusual as it’s the only major moon orbiting relatively close to its planet that isn’t tidally locked. Its orbit is eccentric and instead tumbles chaotically as it’s in resonance with Saturn’s largest moon Titan! The most obvious and unique feature of Hyperion is its deeply cratered surface which, due to its distant orbit, is unlikely to have experienced tidal warming to blur or soften earlier cratering. The unique deep craters of Hyperion produce a sponge-like surface which is believed to be due to compression impacts into Hyperion's high-porosity, low-density surface. Methone – Saturn’s Smooth Egg-Shaped Moon! Sputnik-1 | The World’s First Artificial Satellite! Curiosity | Facts About NASA’s Nuclear Powered Mars Rover! The BEST Space & Astronomy Related YouTube Channels!